advise entity & asset assignment to be most financially efficient for tax and estate goals. financial and estate goal consideration for owner goals. Business owners often use real estate sale leasebacks as a tool to maximize returns. They do this by selling their buildings at higher multiples of cash flow (in the form of the rents they will pay) than the multiples of cash flow upon which their operating companies are valued. Many owners also choose to execute real estate sale leasebacks to generate liquidity that can then be redeployed (i) inside of the businesses to help accelerate growth, or (ii) outside of the businesses to help improve diversification for the owners of the companies. The sale leaseback of company-owned real estate can be a valuable capital option for a family-owned business for several reasons. Most important of these reasons are: improving diversification, funding growth initiatives, strengthening the balance sheet, improving financial ratios, avoiding debt covenants, buying out partners, and estate planning. In addition, a sale leaseback can enable the owner to capture value for the real estate generally in the neighborhood of 11 to 12 times rent (depending on the company’s credit), which is significantly higher than most EBITDA multiples received for selling businesses. (See the simple example below.) Of course, none of the reasons to consider a sale leaseback matter if the sale leaseback provider is unreliable and does not close. It is important to consider the track record and reputation of the provider when using a sale leaseback, especially since the relationship will last for many years. A sale leaseback allows the seller to capture the full value of the real estate. When the real estate is secured by a mortgage, or is otherwise collateral for the company’s debt, the lenders generally advance or lend only 65-75% of the land and building’s value. 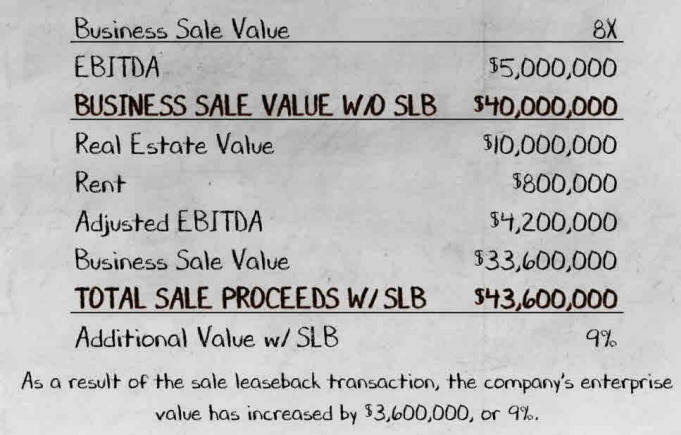 The sale leaseback allows the seller to capture the remaining 25-35% of value and use the proceeds as they see fit. Oftentimes, the seller will use the proceeds to diversify his or her holdings away from the business, where there is typically a concentration of wealth, or to invest in long-term growth initiatives for the business. The liquidity also helps with simplifying or settling estates, splitting up assets, as in the case of a divorce, and buying out shareholders or partners. The company experiences no disruption on the employees or the business because the company continues to utilize the real estate in the same fashion as prior to the transaction. A sale leaseback may strengthen the balance sheet in several ways. First, it allows the company to recognize the full market value of the asset rather than the depreciated book value. Since real estate is a depreciating asset, and GAAP accounting does not provide for a mark-to-market of the asset over time, the value of the real estate continually decreases on the financial statements regardless of the actual market value of the asset. This “hidden value” is freed up by the sale leaseback. Further, under current accounting rules, the sale leaseback can be structured as an “operating” lease rather than a “capital” lease so that the rental obligations show up as a footnote to the financial statements rather than as a capitalized liability. 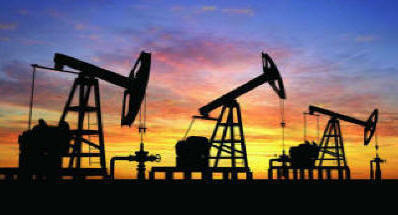 The sale leaseback may also improve financial ratios because of the realization of the hidden value of the real estate. Since the asset side of the balance sheet increases by the amount of the hidden value, the equity increases by the same amount since there is no corresponding change to the liabilities of the company. Hence, the sale leaseback improves the shareholder’s equity and, correspondingly, improves the debt to equity ratios. A very important feature of a sale leaseback is the lack of company financial covenants. The sale leaseback provider makes its credit decision during the credit underwriting stage of due diligence prior to close. 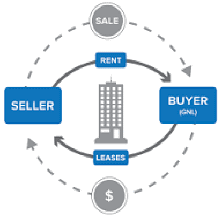 Once the transaction closes, the company and the sale leaseback provider operate in a typical tenant/landlord relationship. Post-closing, the sale leaseback provider does not have the ability to declare a default based upon financial performance of the business. 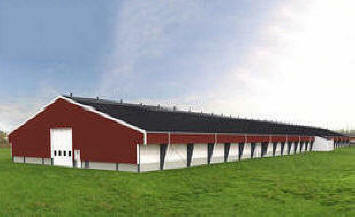 FEC specializes in real estate sale leasebacks as a potential component of tax and finance planning strategy. 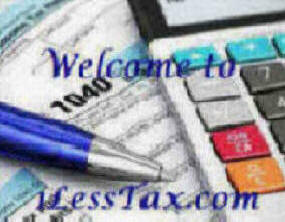 Note: Your Personal or Business Tax Advisor is your final advisor for consultation. IRC 179-Bonus may be used.